In early September, DOI quietly rescinded two memos that provided guidance on protecting vulnerable communities and Native American sacred sites. Oil production in Prudhoe Bay, just outside Alaska's ANWR reserve. 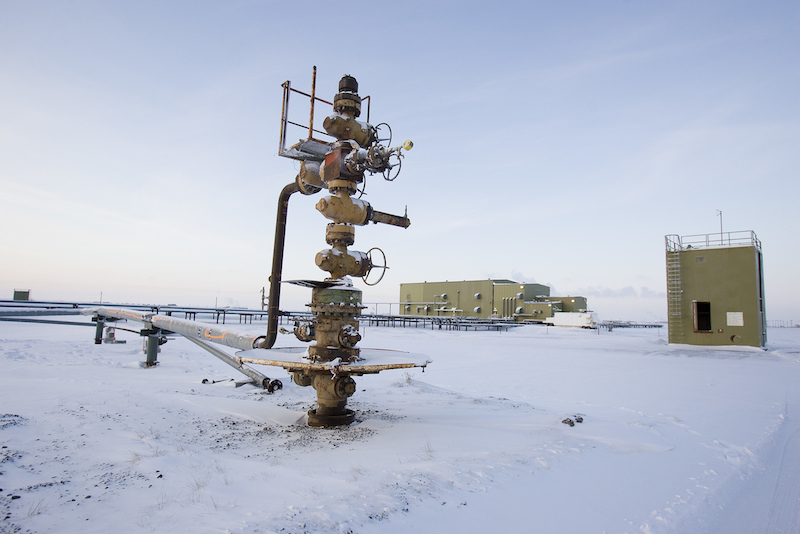 The U.S. Geological Survey has said that the Arctic may hold up to 90 billion barrels of oil. New Mexico’s San Juan county is no stranger to the unequal impacts of resource extraction. The residents of this arid region in the north western corner of the state, once declared an “energy sacrifice zone,” have lived with the legacy of energy development for decades, from uranium mining during the height of the Cold War to coal, oil and gas production that continues to this day. The county suffers from high rates of ozone and methane pollution, and Native and low-income communities there have for years fought for stronger environmental justice protections. Progress has been slow but there was cautious optimism that the Department of the Interior, which manages much of the land in the county, would address some of their concerns in a forthcoming regional management plan. But now it appears the Trump administration is moving in the opposite direction, undoing years of work to raise the profile of environmental justice within the department. In early September, DOI quietly rescinded two policy memos that provided specific guidance on how to implement principles of environmental justice. The first memo, issued in 1995, instructed bureaus to look at impacts of proposed projects and, where necessary, to evaluate the environmental consequences on vulnerable communities or human health. The second memo, drafted two years later, addressed Interior’s responsibility to protect Native American trust resources and sacred sites on federal lands. In addition to rescinding the memos, the department has delayed publication of a manual on how to conduct environmental justice analyses and has asked BLM employees to review environmental justice policy in the context of an “energy dominance” agenda. The Department of Interior appears to have undermined its environmental justice goals by rescinding two memos that provided guidance on protecting vulnerable communities and Native American sacred sites. The rollback of these memos join a sweeping overhaul of the National Environmental Policy Act, a 1969 law that mandated environmental considerations in government planning. Without the memos, BLM field offices may have more discretion as to whether they conduct any kind of environmental justice analysis during environmental reviews of sensitive projects. Mike Eisenfeld, energy and climate program manager for the San Juan Citizens Alliance, said the elimination of the environmental justice and Native American trust policy memos are deeply troubling. “It seems to me more guidance is needed, not less,” he said. Erik Schlenker-Goodrich, the Executive Director of the Western Environmental Law Center, said he wasn’t surprised to learn that DOI had rescinded the two memos. The department, he said, has already made it abundantly clear that maximizing oil and gas development is its top priority. Unlike protections for clean air and water, environmental justice principles have never been codified into law. The two rescinded policy memos were issued in the wake of a 1994 executive order on environmental justice, which was seen as a necessary response to decades of environmental racism and the marginalization of low-income communities in government planning. But ensuring that the broad principles outlined in the executive order are applied at the agency level has been difficult. For instance, DOI’s departmental manual chapter on the subject, which lays out the responsibilities of bureaus in applying environmental justice principles, was only finalized the day before Trump’s inauguration. Rather than build on efforts to strengthen the policy, DOI appears to be undermining it. According to an internal email from a high-level DOI advisor obtained by The Nation, the rollback of the environmental justice memo “signals that the department and bureaus have more flexibility on implementing EJ policy under NEPA.” Without the memos BLM field offices may have more discretion as to whether they conduct any kind of environmental justice analysis during environmental reviews of sensitive projects, such as oil and gas lease sales in New Mexico or drilling in the Arctic National Wildlife Refuge. DOI says the elimination of the memos is part of a larger effort to update and reformat policies that had become redundant or were better addressed elsewhere. In a brief note explaining the decision, DOI’s Office of Environmental Policy and Compliance said the two rescinded policies have been superseded by the departmental manual chapter and “increased awareness, knowledge, and experience” on the part of Interior employees. According to DOI, the policy memos were too specific and the bureaus engaged in conducting environmental reviews needed increased flexibility in order to carry out their duties. But more broadly, critics say that the Trump administration has made it clear that concerns about vulnerable communities are largely irrelevant. In March 2017, Mustafa Santiago Ali, a top environmental justice advisor for the EPA, resigned after reports showed the White House had planned to slash his office’s budget as well as grant programs for minority and low-income communities. The program is still intact, but is now housed within the EPA’s Office of Policy, which many viewed as an effort to exert more control over its programs and initiatives. DOI officials have also looked for ways to push back against environmental justice policy. In 2017 Kathy Benedetto, a former mining lobbyist and top advisor to Secretary Zinke, asked BLM to prepare a memo defending environmental justice reviews. According to Robert Winthrop, who was head of BLM’s social science division until he retired in January, top DOI officials wanted to know if environmental justice considerations were slowing down mining projects in places like Utah. Winthrop said that after consulting with a BLM official in Utah he concluded that environmental justice analyses were not slowing down the permitting process. At BLM, Winthrop was also involved in drafting a guidance document on how to better incorporate environmental justice into the NEPA review process. For example, the document recommended that as part of NEPA, BLM should identify and consult with frontline communities and determine how development may adversely impact human health and the environment. If the bureau uncovered issues of concern, those should be reflected in the environmental impact statement along with a discussion of alternatives or mitigation measures that could lessen the effects on human health and the environment. The 40-plus-page manual, in the form of more than a dozen frequently asked questions, covers the basic steps of conducting an environmental justice analysis and ultimately deciding if mitigation or alternatives are necessary. According to Winthrop, BLM’s social science division worked on the document for more than two years and it underwent multiple reviews, including at least one revision to address policy changes made by the Trump administration. It still hasn’t been released. A spokesperson for the BLM’s Washington office said that the document is not finalized and is still under review. Winthrop, however, said the document was finalized and “camera-ready” by November 2017. Titled “Addressing Environmental Justice in NEPA Documents,” the draft paper seems to contradict OEPC’s claims that environmental justice policy has been fully absorbed by BLM staff and that less specificity, not more, is needed. According to the introduction, the step-by-step approach would have provided a “common framework” for BLM employees while helping to inform the public, especially low-income and minority populations, about how they can engage in the NEPA process. Yet as part of its effort to streamline NEPA, Interior has also said it plans to reduce the amount of time for public input. In New Mexico, for example, the administration has reduced the time to protest proposed oil and gas lease sales from one month to 10 days. And the state BLM office has further mandated that appeals can only be hand delivered or sent by mail. Winthrop says BLM planners who carry out environmental justice analyses are usually not trained social scientists and are overwhelmed by their current workloads, especially as DOI expands oil and gas development on public lands. “If this is an area that isn’t directly mandated then it’s just going to be increasingly left to the side,” Winthrop said. The 1994 Executive Order on environmental justice is still in place along with the departmental manual. Legally, DOI would be on shaky ground if it simply ignored the policy altogether. But the departmental manual chapter and the strategic plan on environmental justice, which have now officially replaced the environmental justice policy memos, set out only broad parameters for the bureaus to follow—they largely serve as guidance. An analysis by the Western Environmental Law Center found that the policy memos provided more detailed guidance than the departmental manual with respect to environmental justice analysis in NEPA documents. In theory, as DOI expands oil and gas development on public lands, including near sensitive cultural and archaeological sites, environmental justice reviews should be more frequent. In Alaska, for example, DOI is moving ahead with an ambitious schedule to complete an environmental impact statement for leasing in the Arctic National Wildlife Refuge’s coastal plain, considered sacred land by some Native American tribes. A review that would normally take years is being rushed to completion in months.